By Norman Chan on Dec. 18, 2013 at 4:30 p.m.
We put up a guide to mini quads earlier this week, which gave me the RC quad bug. I've been flying the Helimax 1SQ mini quad for about a month now, and wanted to share that experience of being a RC novice. Time for something a little bit different. When editing Terry Dunn's primer for how to get started with RC quad-rotors (which, if you haven't read yet, you should), I ended up catching the quadcopter bug. Terry's guide is great because it doesn't dump you into the deep end; he makes practical recommendations on how to get started with RC quads and the hurdles many people don't think about when shopping without prior experience. I wanted to follow his advice and do some testing of my own, using his choice of a micro quad as a means to get started. Terry put me in touch with Heli-Max, the makers of the 1SQ micro quad, and they were generous enough to send a unit out for testing. I've been flying it for about a month now, and wanted to share that experience of being a RC quad novice. It's worth noting that we technically have had some experience with quad-rotor aircraft before, in the form of Parrot's AR.Drone. 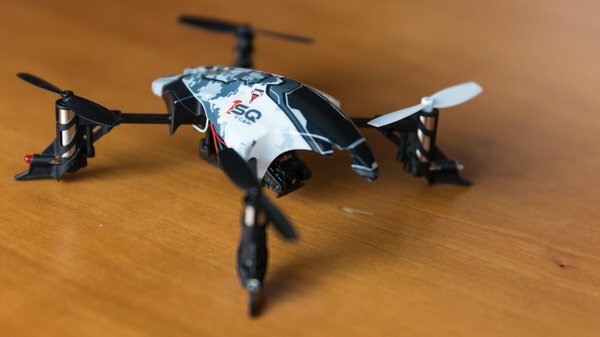 We had a lot of fun with with the AR.Drone, but it's a fundamentally different kind of RC aircraft as something like the Heli-Max 1SQ of DJI Phantom. As Terry points out, the 1SQ is a "hobby grade" quad, meaning that it's designed to be tinkered with and repaired. You can disassemble the entire craft to swap out parts and use your own transmitter for flying. The AR.Drone--which I have to reiterate, isn't a true autonomous drone--is built for a closed system, and only works with smartphones (Android support added in the 2.0 model). That makes it more of a smartphone accessory than a hobby quad, and a $300 one at that. Anyway, one of the nice things about the 1SQ is that everything you need to get started flying comes in the box. I got the RTF (Ready to Fly) V-Cam model, which means it included a basic 2.4GHz remote control transmitter and an onboard camera for taking photos and video. 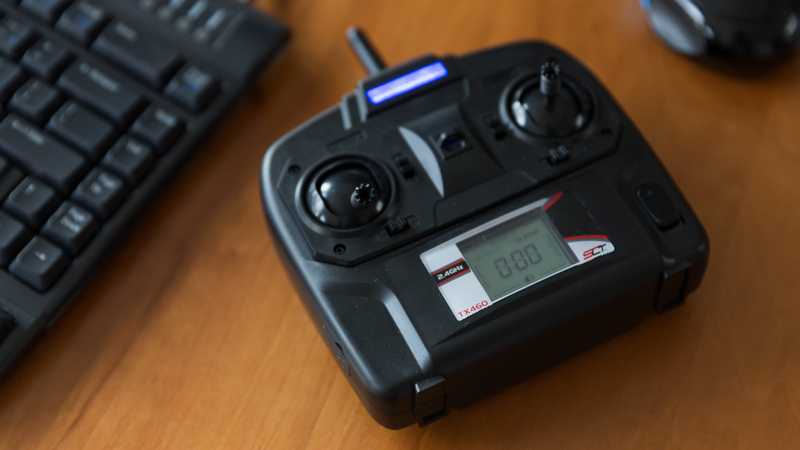 Helimax also sells an RTF model without the camera for $100, and a $70 SLT (Secure Link Technology) model that you can pair with your own transmitter. The $100 RTF model is my recommendation because I didn't find the camera very useful or reliable. More on that in a bit. 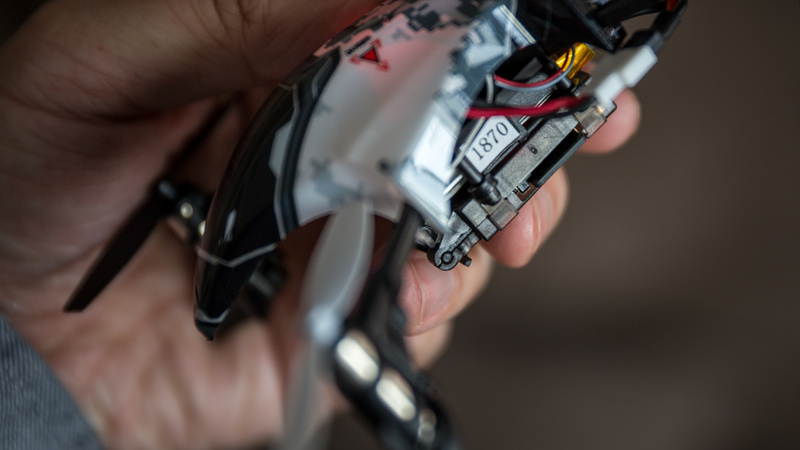 In addition to the mini quad and the transmitter, the kit also comes with four AA batteries you need for the controller, a small 250mAh LiPo battery for the quad, USB charger for LiPo battery, 2GB microSD card, and an extra set of rotor blades. The extra blades aren't interchangeable between all of the existing rotors, since they're matched in pairs of two (on opposing sides of the X). That means you only have two extra blades for each set, and I'm already down to my last replacement after a month. Replacement blades are $7.50 for a full set on Amazon. The two-stick transmitter looks and feels deceptively cheap, but it actually gives you a lot more control than I expected. There are the aforementioned two control sticks for flight control: the left stick controls power (elevation) and yaw (rotation), while the right stick controls pitch (moving forward and backward) and roll (banking/strafing left or right). Four additional tabs let you adjust trim for flight stabilization, which itself has a bit of a learning curve. A basic LCD screen on the bottom of the transmitter shows you thrust power in percentages, and four shoulder buttons toggle an automated directional flip and camera recording. The first thing I would recommend doing is switching the quad to the Basic flight setting and manually adjusting flight sensitivity to around 15%. The default is at 35%, which I found to be too aggressive for indoor practice. The flying experience with the 1SQ, once I got use to it, was very delightful. The quad has an accelerometer and gryo on its board for auto-stabilization, which calibrates itself every time you plug in the battery. Performing a level calibration had the biggest effect on whether the 1SQ could hover in place; there were plenty of times that it would start banking in one direction because of a miscalibration and I had to set it down or try to compensate with trim. Response latency is also excellent with the 1SQ, since it uses good old radio signals for its transmitter (as opposed to IR or Wi-Fi). The range of the included transmitter's radio was also more than sufficient for my flights. 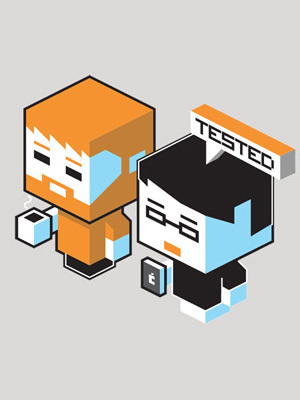 In flying the the 1SQ, you quickly learn two things about flying quads. One is that you have to be very delicate with the controls and not slam one of the sticks in any direction. In fact, tweaking the amount of thrust power to put on the prop motors is an art of its own. Giving the quad 50% power will get it off the ground, but you need to find the right percentage that will keep it at the height that you want. For me it was between 85 and 95% when flying indoors. But giving the quad too much power and it'll quickly hit the ceiling and come down crashing. It's a little difficult to maintain height when the rotational controls are also on the same stick as power. I would accidentally drop power when making a turn, causing the quad to lower to the ground and then bounce back up as I quickly readjusted. Before I became competent at flying the quad, I became very proficient in "hopping" it around the office. The other thing you'll learn with a mini quad is how screwed up your sense of orientation becomes. This is something Terry explicitly mentioned in his guide. Flying the quad when it's oriented with your directional field of view is simple, but the moment it turns off axis to point in a different direction, your brain has to do some mental gymnastics to figure out what left and right mean. It's much easier to direct the quad with the right stick alone, using banking instead of turns. You can fly the 1SQ both indoors and outdoors, and I had more fun with the former than the latter. It really is a lightweight aircraft, so small breezes have a big effect. You can quickly elevate the 1SQ to 40 feet, but be prepared to lose control of it when it gets caught in an updraft. The battery is also only worth 10 minute flight sessions, but is quick to recharge in about twice that time. It's recommended that you let the battery cool down before recharging, so your best bet is to get a spare for extended outings (~$30). Then there's the onboard camera feature. On the one hand, it's really cool that Helimax was able to incorporate a 720p camera on this mini quad, along with a slot for a microSD card. Its no GoPro or even the onboard camera in the AR.Drone, but I can see that the idea is to help beginners get used to flying while also taking photos and video. Unfortunately, the photo-taking experience was just unreliable, and the working results unimpressive. The camera isn't wide-angle enough to give you a sense of the drama of the elevated perspective, and the you're basically shooting blind because you have no live view or feedback. In fact, you don't even know if the camera successfully took any photos or video until you plug the card back in. There were times when videos wouldn't save properly and give me 0 MB files, and other times when the camera wouldn't stop recording and output the entire session in one large file. Couple that with the mini quad's stable elevation limitations and this isn't the quad you're going to use to shoot viral YouTube videos. 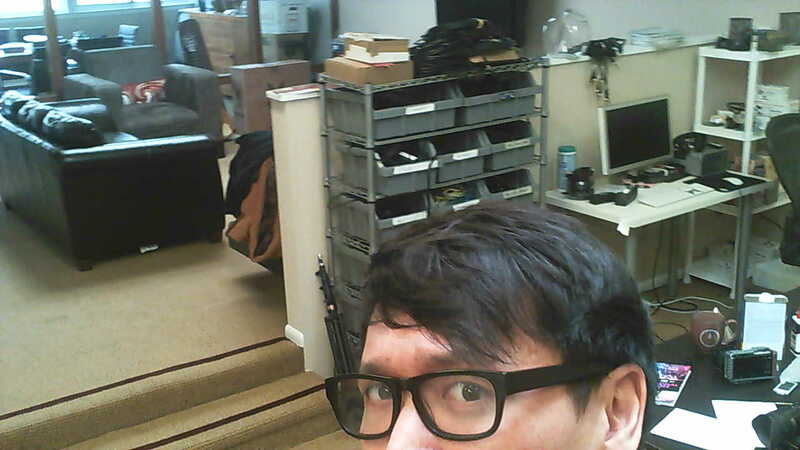 Here's a selfie I took with the 1SQ flying about 4 feet from my face. Definitely not worth the extra $30. I ended up having more fun with the 1SQ than I did with the AR.Drone, even though the latter had live view video controls and was overall easier to fly. 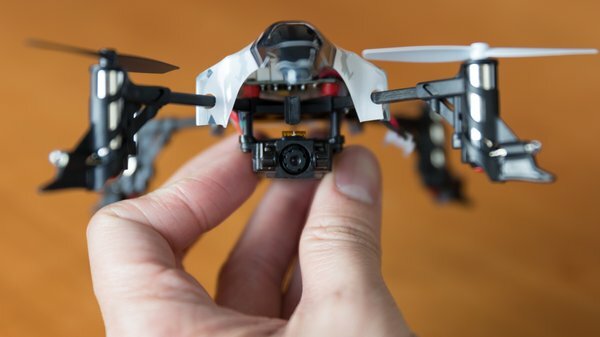 The responsiveness of the nimble mini quad is its greatest asset, and the basic RTF model isn't too expensive at $100. I'm still not ready to graduate to a DJI Phantom, but the 1SQ is more than enough to keep the quadcopter bug at bay while I work on my learner's license.